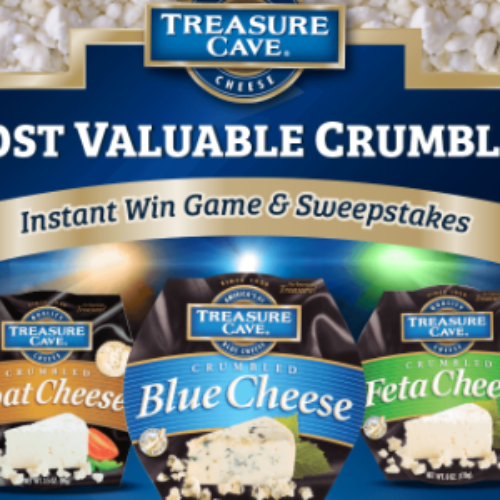 You can enter the Most Valuable Crumbles Sweepstakes from Saputo Cheese for your chance to win a 65″ LED Smart 4K HDTV with HDR. You’ll also have a chance to be 1 of 20 $100 Fanatics Gift Card, or 1 of 100 Serving Sets. Entry ends March 31, 2019. I know my subscribers are going to love this sweepstakes. You all seem to sign up in droves for these HDTV giveaways. Honestly I don’t think my living room is big enough to handle the enormous 65″ TV they are giving away. How far away from a behemoth like that do you have to sit? I’ll bet the actors are virtually life size on a TV of that stature! I am fortunate enough to have a flatscreen TV but it’s more in the 30″ range and it isn’t smart, nor 4K. What does that make it, ignorant and 3K? I have friends who still have one of those early flat screen numbers that’s built into a cabinet and 2 feet deep. Sometimes I give them a gentle teasing for their ancient artifact. If it ain’t broke, don’t fix it, they tell me. Speaking of built into a cabinet, you young bucks have probably never even seen a tube tv in real life, in all it’s washed out color glory. And that’s assuming your family could afford one that had color. Just imagine a family of 5 huddled around a rounded 20″ screen, watching the latest Perry Mason, sending junior up to change the channel or increase the volume. That’s right, there was even a time before remote control. And then there was the especially exciting practices of banging on it to fix the signal, and wrapping aluminum foil on the rabbit ears in hopes of getting a better picture. And if that didn’t work, and you were particularly unlucky, you were tasked with holding the rabbit ears up at a certain angle because for some strange reason, human bodies turned out to be great signal conductors. Oh yes, those were the good old days. I do want to wish all my subscribers the absolute best of luck to win this contest! Let me know in the comments below if you were alive before HDTV’s, before remote controls, or even before color! I spent a great deal of my childhood as either the remote control or the antenna. On a good day, 3 TV stations were available otherwise we were limited to 2. I was alive before remote controls and HD T.V.